This month is National Novel Writing Month, and I’m taking part for charity (sponsor me). It means a bit of a delay in scheduled programming. You can read about my start here, and the first weekend here. So here we are again, a few days into week 2. How are things going? Well I’m happy with my progress. 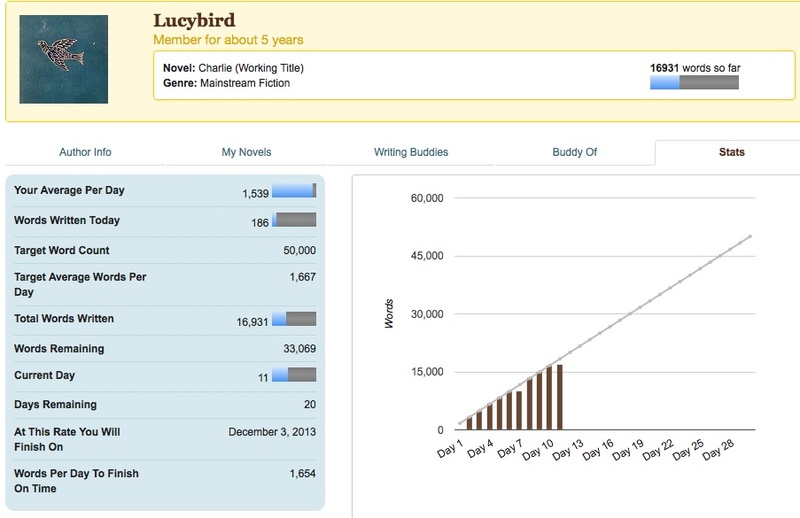 I’m consistently a couple of hundred words above NaNoWriMos suggested daily targets, and sitting now at almost 17,000 words (before today’s writing). I’m fairly confident that I’ll be able to make my personal target of 25,000 words. Week one has been a bit up and down. Writing after work was easier than I expected, but did cause some bedtimes later than I would have liked. I’m hoping to get a better handle on that this week. I may use Write or Die to try and kerb my procrastination. And I’ve already started writing a little in my breaktime at work (only about 200 words today, but every little helps). In fact I found it harder to write on my days off. Partly because I was at a bit of the story I was struggling with, partly I think because I relaxed too much and then ended up with no time. Then on Thursday (when I was actually doing quite well) I got a migraine mid-flow and couldn’t keep going. That meant I had a lot to do on Friday, and had to sacrifice a visit to the bank in order to catch up. The twitter sprints have been both a blessing and a curse. If I manage to catch the beginning of one then they are quite a good way to keep going in little bursts, but if I come on twitter in the middle of one I have a tendency to wait around for the next one, and twitter is distracting. Twitter’s been a good tool for asking questions too, but has helped me to keep over thinking at times. You can’t devote too much time to thinking with NaNoWriMo, you just need general ideas and a picture. My page of ideas has become a bit question mark heavy. Using the boyfriend’s laptop when at his has helped too. He doesn’t have it connected to the wireless, which makes it much harder for me to be distracted. At the moment I’m reading The Elements of Eloquence (by Mark Forsyth, who is just, awesome) and I think that’s making my writing better too. Possibly the perfect book to read whilst writing, or before. I’ll probably look back on what I wrote before reading this book and laugh at myself (which is exactly why my first NaNoWriMo novel is just sitting doing nothing). So, yeah, that’s helping too. Money-wise things are going good too. I’m sitting at almost £200 now, which is fantastic. Of course charities always need money so if you haven’t already donated please do. It doesn’t have to be a lot, and you can donate anonymously if you want to.